When you have eight returning all-conference players on the state's top ranked girls soccer team, it might be easy to get overlooked. But not for Brookfield Central junior midfielder Brandi Thomsen. As sophomore Thomsen not only earned first-team All-Greater Metro Conference honors, but second-team All-State recognition besides. 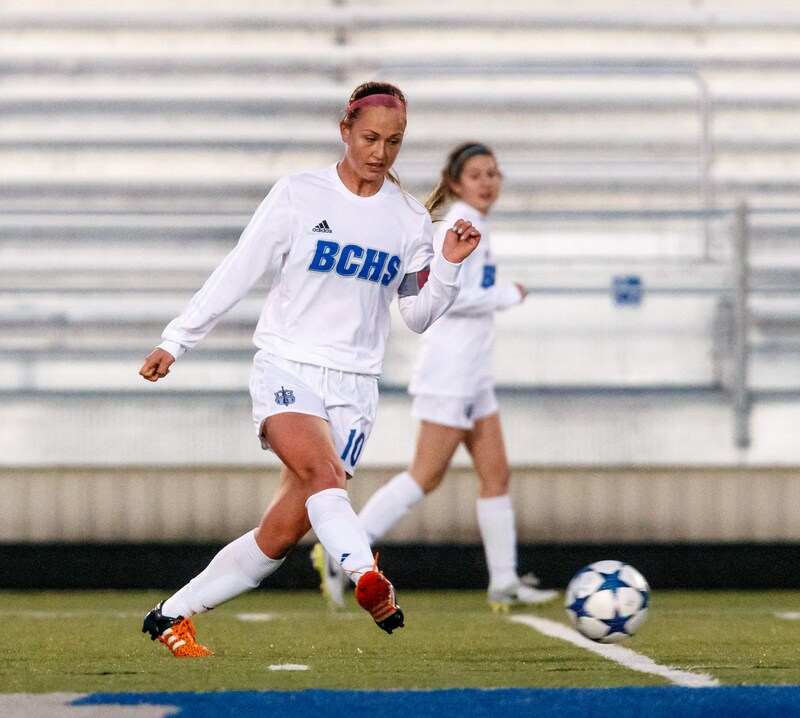 However, Brandi is surrounded by players like sophomore forward Emma Staszkiewicz, a first-team All-State and All-GMC performer, and seniors Caroline Busch, a first-team All-GMC forward, and Claire Haynes, a first-team All-GMC and honorable mention All-State midfielder. Now add to that second-team All-GMC selections - junior midfielders Jenny Cape and Sarah Knopp, junior defender Meghan Stritesky and senior goalkeeper Sarah Pasternak and you have just touched the tip of the iceberg. "It's awesome," Thomsen said. "You can feel yourself being pushed every day, in practice especially. I can tell the difference from club to high school. In club we have good players, but in high school we have even better players. Isn't that crazy. It's usually the other way around. That's something I look forward to every high school season. "Everyone is really talented - we're a very deep team. You know they're going to have your back. If it's not your best ball (on a pass) they'll make something out of it." Coach Dan Makal, who also coaches the boys team, takes over a girls team which tied Divine Savior Holy Angels for first last year but then lost to the Dashers in the sectional semifinals in a shootout. He knows his squad is talented and deep and plays their roles well. "It helps when those players like Emma, Caroline and Claire are around, but we have a lot of other players who factor in with their roles," he said. "They're understanding of how each of them fits. Sometimes peoples' pieces are bigger in the puzzle, but it doesn't matter because it's still a puzzle." Then he talked about Brandi's role. "Sometimes her piece of the puzzle is really big," he said. "She has the ability to step outside of her role, but she hits her role every time she plays. She's just super consistent. She splits her role. She's an attacking player for us and provides a lot of great defensive cover. She goes along with how we structure (our game plan), how we play it. She's completely unselfish. "The thing about Brandi is she's not going to be a massive stat person. If you look at the stats in the paper, she is not going to totally show up there. But if you watch her play, every coach wants her. She's already built for college (she accepted a scholarship at the University of Cincinnati)." Last season Thomsen finished fourth in scoring (23 points) behind Staszkiewicz, Busch and Cape with 6 goals and 11 assists. She had a goal and an assist through the first 5 games this season. Making sure things go well on the field is Thomsen's main job and she handles the pressure well according to Makal. "Yeah, you can't see a real demeanor change," he said. "Anything you say at halftime, she is always real receptive to it, asks questions. She's not a kid that's really rattled. If we're losing, it's a matter of what's next. It's a matter of refocusing. You can never tell if she was down by her body language." Brandi breaks her role down in simple terms. "I come to practice and come to every game and bring positive energy and push my teammates," she said. "Setting the pace for the game; setting the tempo." So what about the pressure? "It's not coming from my parents (John and Liz), not coming from my coach," she said. "It's kind of on myself. I want to score, but I know there are other people who are in position to do it. So when I look back at the bigger picture, it (her role) makes sense. Hey, assists are good (she laughs)." Makal talked about Thomsen's comeback from injury which caused her to miss her freshman season. "Brandi broke her ankle the Friday before tryouts her freshman year," he said. "She missed the season and it crushed her. Last year was her first year of full competition of high school soccer. Watching her work back to being able to play again and having this pivotal role on the team was something. She made all-conference as a sophomore, second team all-state as a sophomore. The other coaches know the quality of player she is. Her ability to take over situations because she's improving so well is one of the things that make her better than the average player." Brandi first got into soccer when she was 7 years old, playing for the Elm Grove recreational team. 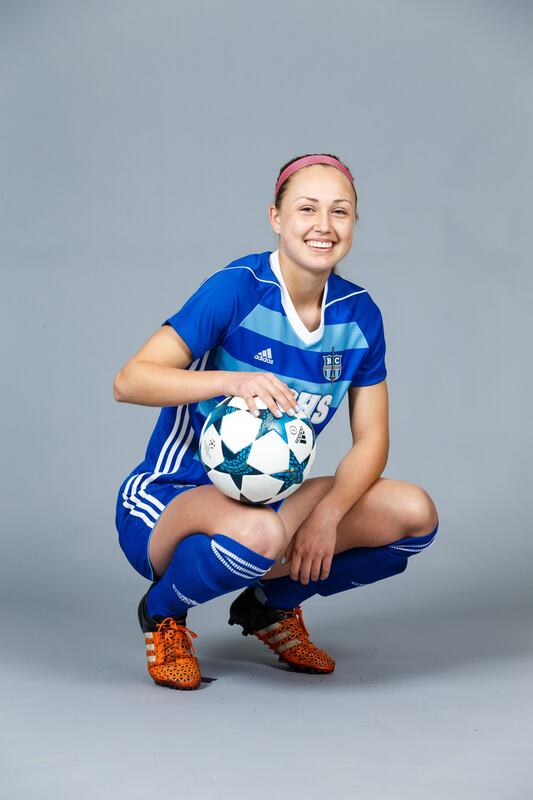 She knew she would stick with soccer in 7th grade and credited John Burke, her coach. "Coach Burke was really influential and I knew I wanted to play collegiately too," she said, already looking forward to college at that young age. "I also liked the team atmosphere. Growing up I always had friends on my team. I liked my coaches. You get good exercise obviously. It was something creative. It was almost like an art. There is always something to learn. It's like trying to problem solve with your teammates." Thomsen has carried this over to her high school career. "I connect with my teammates pretty well," she said. "Searching the field I'm pretty good at. Being on the same page as my teammates. Across the whole team, we're pretty good at that." Another thing Brandi has carried over is her work ethic. "I'm a hard worker," she said. "I want to be able to eventually say I've fulfilled my potential and I think the way you get there is working hard." Makal feels that Thomsen is always looking to get better and look for ways to help out the team. "The team rules. The first goal is to score," he said. "If you can't do that, can you set someone else up to score. So often if Brandi doesn't set somebody up to score, she sets somebody up, who sets someone up to score. "She is so good on the ball she doesn't make many turnovers. If she does, she'll steal the ball back right away. She is the first they (backline) want to find. She knows where the ball needs to go. She really understands the whole style of what we try to do. When your players are out there doing it, that's the best part." "That's a tough question," he finally said. "The idea of growth, there is no ceiling to what you can become. If she decides what she wants, the sky's the limit." Not surprisingly, Thomsen was more critical when asked the same question on improving. "I need to work on my explosiveness - on the ball and off the ball," she said. "I also need to work on my finishing all around. For example Emma Staszkiewicz uses her speed with the ball in a way the opponent doesn't know what she's going to do with it. I'm not that fast. I need to use my abilities to slow, slow, QUICK and be able to throw off the defender." "By dribbling through the cones or dribbling through defenders," Brandi said. "Going to make a move and then accelerating. I've been happy with my progress." Leadership is another important part of Thomsen's improvement, as she was named a junior captain to go along with seniors Busch and Haynes. "When we choose captains we have some different ones," Makal said. "Claire is more vocal and Caroline's the gamer. She's the athlete, she'll fight for everything. Brandi's in the middle. She more of the technical one and she leads by example. Leadership just drips out of her - kind of like sweat." Being a captain is something Brandi is proud of. "I think it's very important," she said. "I was surprised (she was named captain) because there are so many leaders on this team. I can't think of one person who is not a leader. "I'm working on being more vocal, but I lead by example. I look up to both Caroline and Claire Haynes. Claire's very positive. Like when someone needs that pick me up, she'll say 'OK, you'll get this next one.'" Brandi is looking forward to the rest of the regular season and then the post-season when everyone starts out 0-0 again. "We realize all the rankings but that doesn't mean anything," she said. "We still haven't won state." FAVORITE MOVIE: 'Pink Panther' with Steve Martin, Animated Movies. FAVORITE SPORTS RIVALRY: Divine Savior Holy Angels. MOST MEMORABLE SPORTS MOMENT: Beating Brookfield East, 6-0, last season. WHAT WOULD YOU LIKE TO DO IN THE FUTURE? Accepted scholarship to play soccer at the University of Cincinnati. Interested in possibly studying dentistry or psychology. Wants to be a soccer coach.